I’ve always had a penchant for plants. Thing is, I don’t merely have a black thumb. I have a black hand or maybe even a black arm. I kill plants with a disturbing amount of frequency to the point where when I try to purchase plants, my friends try to talk me out of it for the sake of the plant. The plant sitting on my desk right now has lasted over half a year so far and I’m increasingly beginning to suspect that it’s not really a plant but rather a rubber gadget that my friends gave me to placate my gardening desires. Well, today, something even better comes along. Gardening Mama! Yes, Mama is no longer content to stay in the house and cook after conquering the NDS, Wii and iPhone consoles. She is now moving on to gardening. 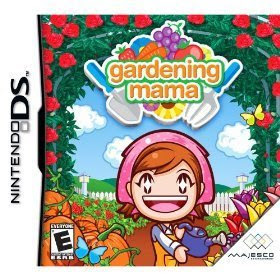 Gardening Mama for the NDS comes out today and you can use your DS stylus to plant, prune, pick and landscape your garden. Gamers manage their gardens through the seeding, blooming and maturing phases and then make products out of it. For example, you can grow strawberries to make jam or pumpkins to carve lanterns. Now I can finally garden, guilt-free. There's an application on facebook where you can grow plants to save rainforests... I love it. If my plants die, i can just raise them back from the dead. Yay! Sounds fun and better than palnt killing! thanks for stopping by my blog would you like to swap links? Of course! Love your site, fashion and film -- what a great idea, Film Upstart!